Interview between Charlie Avis, Public Information Officer for the Secretariat of the Basel, Rotterdam, and Stockholm Conventions, and Dr. Abdul Nabi Al-Ghadban, the Coordinator of the centre. Charlie Avis (CA): Good morning Dr. Al-Ghadban, thank you for time in sharing with us the work of the SCRC Kuwait. 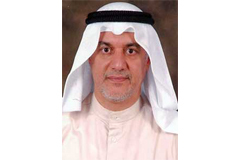 Dr. Abdul Nabi Al Ghadban (ANAG): Thank you, Charlie, for this kind invitation! CA: Firstly, please tell us a little bit about the Regional Centre (RC) itself. Where are you housed, institutionally and geographically, how many staff do you have, and when was the RC established: basically how did the Centre come about? ANAG: The RC is located or hosted by the Kuwait Institute for Scientific Research (KISR) in the state of Kuwait which is located at the north western part of the Gulf region. KISR was established in 1967 to carry out applied scientific research and to provide consulting services for both governmental and private sectors in Kuwait, the Gulf region and the Arab World. Due to its nature of work and based on its capabilities in terms of experienced manpower (researchers, professionals and technicians), number of laboratories and the variety of up to date equipment) KISR was nominated to serve as a Stockholm Convention Centre by the parties of Asia region, and was endorsed by the Conference of the Parties of the Stockholm Convention to serve as a Stockholm Convention Regional Centre in 2009. The number of staff members totally devoted to the RC is 15; other staff members who are involved in several related field of interest are also accessible whenever needed. CA: Do you serve all of the countries of the Gulf region or Middle Eastern region? How many Parties are there? ANAG: We serve all parties of the Convention in general and in particular we serve the countries located in the West Asia region, namely; Saudi Arabia, United Arab Emirates, Oman, Qatar, Bahrain, Kuwait, Yemen, Syria, Jordan, and Lebanon. CA: What are the main technical issues or focus areas covered by the RC? ANAG: The main objective of the RC is to strengthen and further develop the capabilities of countries in West Asia region in implementing the Stockholm Convention through capacity building and the transfer of environmentally sound technologies adopted and used under the Stockholm convention. Therefore our priorities are to 1) Coordinate with the 10 served members regarding the compliance of the stated recommendations by the POPRC and the conference of the parties; 2) Provide all served members with needful technical support to assist them in fulfilling the requirement of the convention; and 3) Upgrade the RC with up to date facilities such as equipment for providing better services. CA: I’m sure you work on POPs and on the Stockholm Convention’s Global Monitoring Plan in particular. What would you say is the level of awareness amongst policymakers and decision-makers in the region concerning POPs? And amongst the general public? ANAG: Yes the level of awareness is somewhat progressing well compared to the past period. A good example is the development of NIPs in most of the countries we serve. This reflected good rate of awareness as far as the policymakers in such countries. Obstacles that prevented other countries in developing the NIPs is currently monitored by the RC and we hopefully reach a level where all parties have not only the NIPs but also the updated ones based on the latest information of the SC. As far as the general public it varies, in some counties it is of an advanced stage, but in others such as in Syria and Yemen is not in a good stage, and this is interpreted due to the effect of state of wars in such countries. We hope that such conflicts be resolved soon so that we do our mandate more effectively. ANAG: our vision for evolving the RC in the next coming 5 to 10 years is to ensure that all members we are serving would have the means and support needed that can be offered by the RC to reach the level of full compliance with the Stockholm convention. CA: Are there any key events towards which you are currently focusing your energies and resources? ANAG: currently we are focusing in the following: 1) transfer or disseminate scientific data that are obtained from implemented projects related to POPs to other members; 2) conduct frequent meetings and or training workshops related to the implementation of recommendations set by the SC; 3) facilitate more cooperation between the RC and UNEP as well as other UN-bodies. CA: The theme of the 2015 Triple COPs was “Science to Action”. What does “Science to Action” mean to you and how might it guide the work of the RC? ANAG: To me science to action implies delivering or meeting the objective in a smooth way. Science will create data that can be validated at a later stage. Whence such validation is being done then a good justification for banning or getting rid of a certain chemical or pollutant would be granted. The second step is to convey this message to the community in a very professional or meaningful manner so that the community understand the issue and support the scientific community in meeting the objective of the convention. It is simply all about the support given by the community to the scientist. CA: Thank you, for your time and for your answers. Good luck with your important work!